I finally had the time to sit down and create the quick form that I have been looking for from other people. I know some people embed their SBG scale right underneath each problem on their assessments but because my standards are mixed up in a lot that we do, I felt like I needed a separate sheet to communicate to students their progress towards mastery of a standard. I use the scale that Chris Robinson uses in his class (Red, Yellow, Green) however my levels mean something different. It is also something similar to Kelly O’Shea’s idea. (Mastery, Developing Mastery, No Mastery, No Data). Red= no progress towards mastery. No mastery shown. 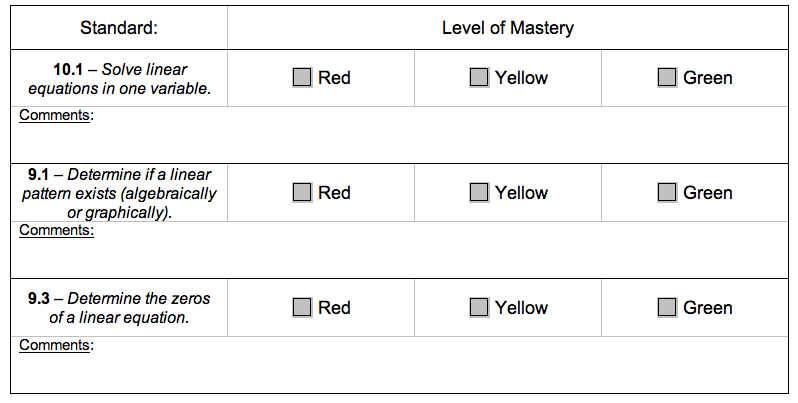 Green=mastery of this standard (you may be asked to show mastery at any time in the year) Mastery Shown. Depending on the standards being assessed I will change the size of the list. I will attach this on the front of their assessments after I give them feedback and they will use this to fill in their standards tracking sheet (kept in their notebooks). I am not sure how this will work but tomorrow is the first go at it and I will be back to update you on the status of the functionality of this sheet. Feel free to use this sheet or share other ideas/forms or to change this one and share your better idea with us. I’m a certified Mathematics Teacher that has been teaching for 10 years. I've taught at Hana school which is a Pre-12 school located in the most amazing town, Hana Maui. I currently work as a resource teacher supporting teachers in any way I can. I miss teaching in the classroom and will be resuming there sooner rather than later. I am hands down a student centered teacher and one of my class motto’s is NEVER GIVE UP!